Auto loan rates are on the rise, and in certain states, residents are really feeling the sting of higher financing costs. In a recent study examining rates on car loans across the country, we discovered the East Coast and southern portions of the U.S. are home to some of the highest rates today. The study surveyed base interest rates on every new car loan product in the U.S., aggregating them all and then averaging by state to come up with a top 10 ranking of the states with highest rates overall. However, it’s not all bad news for local residents — we also identified the financial institutions in each state providing the lowest interest rate for a handful of common loan terms. See the findings below and find out where it’s most expensive to finance a vehicle today. The nation’s smallest state is home to the highest car loan rates on average, and the only one to break 5%. Another East Coast state, Connecticut, takes second place with an average 4.48% average interest rate on new car loans. Even so, it is home to a few credit unions offering highly competitive rates, shared by many of the other states on this list. New Jersey, with one of the highest unemployment rates in the country, falls at third place. Credit unions claim the lowest base rates across each popular term in this state. At number four, Massachusetts banks and credit unions offer an average 4.21% new car loan rate with all terms considered. However, Navy Federal Credit Union and USAA provide residents highly competitive options in this state as well. Moving to the southern portion of the country, Louisiana ranks number five with an aggregate average rate just barely below that of Massachusetts. Dropping closer to the 4% mark, West Virginia takes sixth place for the highest auto loan rates in the country. Familiar names round out the lowest rates on 36-, 48-, and 60-month auto loans in the state. At number seven, Delaware’s average new car loan rate is slightly lower than West Virginia, though still about 4%. 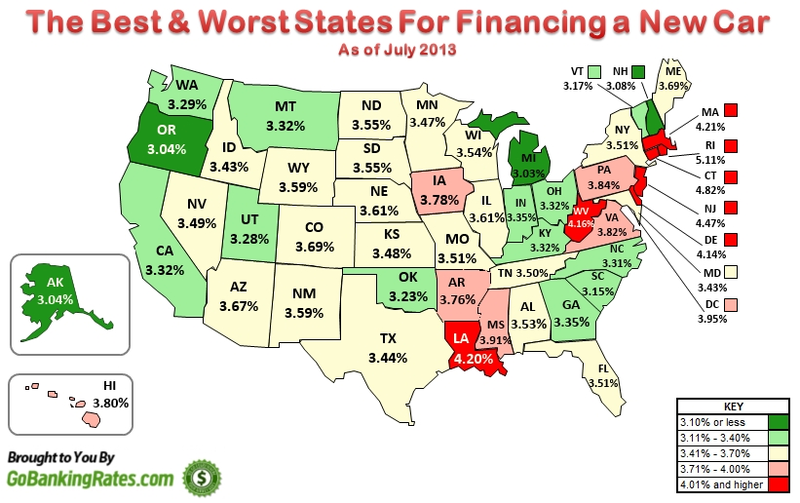 Another southern state makes it to the list — at number nine, aggregate average rates on new car loans in Mississippi are 3.91%, though local credit unions offer low financing options to residents who qualify. Finally, coming in at number 10, Pennsylvania rounds out our list. Residents of states that ranked poorly for affordable interest rates shouldn’t necessarily give up the search for competitive financing options. Interestingly, credit unions consistently offered the lowest base rates in each state, mirroring the top rates in states that ranked well for low rates overall. These financial not-for-profits should be any car loan applicant’s go-to source of financing if interest rates are a concern. Additionally, CFP at Wealth Resources Group, Neal Frankle, advised borrowers consider the type of institution they’re applying for a loan at, and not just where it’s located. It’s possible cheaper financing options can also be found from larger institutions “with cheaper and greater sources of capital,” he noted. Finally, even though some rates are higher than others, auto loan rates in general are still quite low compared to the costs associated with other types of borrowing. “Interest rates haven’t risen so dramatically that they should have a huge impact on a purchase decision. Even if the difference is, say, $10 a month, yes, that’s $120 a year and $480 over the life of a four-year loan. But is it the sort of penalty that should prevent you from buying a car? I don’t think so,” said Christian Gulliksen, senior automotive editor for CarsDirect.com, a car resource offering bad credit auto loan information. Auto loan rate data was compiled using the GoBankingRates interest rate database. GoBankingRates partners with Informa Research Services, Inc. (www.informars.com) in aggregating up-to-date rate information belonging to thousands of local, national and online U.S. banks and credit unions. Although the information has been obtained from the various financial institutions, the accuracy cannot be guaranteed. This study examined base interest rates offered by financial institutions on all new car loan products, using a state-wide average of these rates to determine ranking. Demographic data is supplied for reference only and was not considered in determining state rankings. Auto loan rates are as of July 24, 2013 and are subject to change at any time at the discretion of individual institutions. Rates may have changed since this date. Population data based on U.S. Census Bureau 2012 estimates. Vehicle Registration according to U.S. Department of Transportation, Federal Highway Administration, Highway Statistics 2010, MV-1 and MV-9, available at http://www.fhwa.dot.gov/policyinformation/statistics.cfm as of March 16, 2012. Income data as of 2012 via the Bureau of Business and Economic Research. Unemployment rates according to Bureau of Labor Statistics, Seasonally Adjusted for June 2013. Banks Versus Credit Unions: Where’s the Best Place to Get Your Houston Auto Loan?